As I’m sure regular readers know – I am a complete list lover. I have lists for everything and my to do lists run my life for me. It’s the only way to ensure that everything in this busy household gets done. In the past my lists have often just ended up as part of my main notebooks that are in use at the time, but one recent review item from Bureau Direct seems to have changed things. Let me introduce the Mark’s Storage it A6 notebook. With the innovative plastic cover with a ziplock section where you can keep (and still use) your smart phone, it’s certainly different from many other notebooks. What I’ve started doing though is using this ziplock section to keep a pen in and then having this as my go to list book. 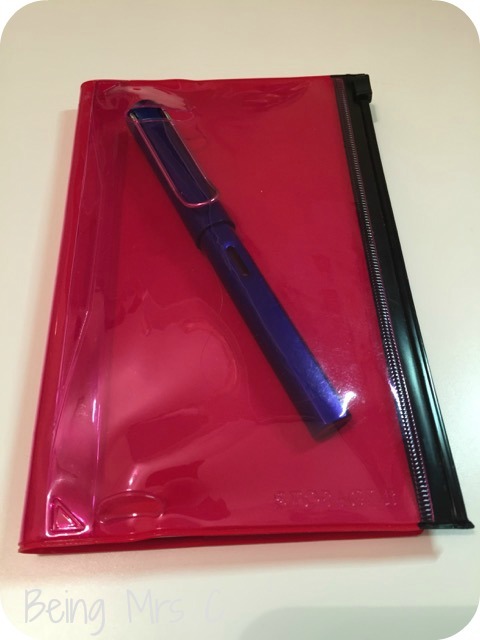 It goes everywhere in my handbag with me and I’m loving having somewhere secure to keep a pen with it and also tuck away those important bits of paper (receipts, business cards etc) that you need to keep safe until you get home. As I’m finding with more things these days though, it’s sometimes easier to explain how it all works in person, rather than via the written word, so here goes with a little video review. The Mark’s Storage it Notebook really has become such a key part of my day to day life that it seems hard to imagine what it was like before I used it. All my master lists are in there at the moment from blog posts I need to write, through to things my kids need on certain days for school and nursery. I realise that may seem a bit of an extreme thing to say about a notebook, but it’s the truth. It’s strange how stationery can become such a fundamental part of day to day life! Disclaimer: I was sent the Mark’s Storage it A6 notebook to review as part of my role working with Bureau Direct. All opinions are my own. I know – everyone that I’ve shown it to has been rather impressed. As a fellow lister, I think I need to get my hands on one of these! I thought I was doing well just because I’d got myself a regular notebook dedicated to shopping lists, but the problem with it is I can never find a pen. This looks like it solves lots of problems!